Median Putnam contestants, willing to devote one of the last Saturdays before final exams to a math test, are likely to receive an advanced degree in the sciences. It is counterproductive on many levels to leave them feeling like total idiots. Last February I made a big public apology for having caused one of the biggest scoring errors in HMMT history, causing a lot of changes to the list of top individual students. Pleasantly, I got some nice emails from coaches who reminded me that most students and teams do not place highly in the tournament, and at the end of the day the most important thing is that the contestants enjoyed the tournament. So now I decided I have to apologize for 2016, too. The story this time is that I inadvertently sent over 100 students home having solved two or fewer problems total, out of 30 individual problems. That year, I was the problem czar for HMMT February 2016, and like many HMMT problem czars before me, had vastly underestimated the difficulty of my own problems. I think stories like this are a lot worse than people realize; contests are supposed to be a learning experience for the students, and if a teenager shows up to Massachusetts and spends an entire Saturday feeling hopeless for the entire contest, then the flight back to California is going to feel very long. Now imagine having 100 students go through this every single February. So today I’d like to say a bit about things I’ve picked up since then that have helped me avoid making similar mistakes. I actually think people generally realize that HMMT is too hard, but are wrong about how this should be fixed. 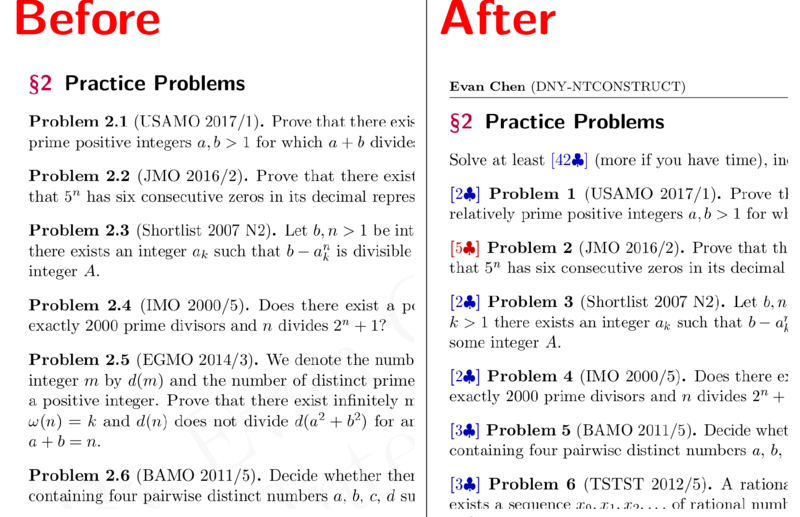 In particular, I think the common approach (and the one I took) of “make problem 1 so easy that almost nobody gets a zero” is wrong, and I’ll explain here what I think should be done instead. A problem is a gimme if nearly every contestant actually solves the problem on the contest. The consensus is always that the early problems should be gettable but not gimme’s. You could start every contest by asking the contestant to compute the expected value of 7, but the contestants are going to notice, and it isn’t going to help anyone. In contrast, with a gettable problem, even though some of the contestants will miss it, they’ll often miss it for a reason like 2+3=6. This is a bit unfortunate, but it is still a lot better if the contestant goes home thinking “I made a small arithmetic error, so I have to be more careful” than “there’s no way I could have gotten this, it was hopeless”. At the IMO, there are two easy problems (one each day), but there are only six problems. So a full one-third of the problems are gettable: we hope that most students attending the IMO can solve either IMO1 or IMO4, even though many will not solve both. If you are writing HMMT or some similar contest, I think this means you should think about the opening in terms of the fraction 1/3, rather than problem 1. For example, at HMMT, I think the czars should strive instead to make the first three or four out of ten problems on each individual test gettable: they should be problems every contestant could solve, even though some of them will still miss it anyways. Under the pressure of contest, students are going to make all sorts of mistakes, and so it’s important that there are multiple gettable problems. This way, every student has two or three or four real chances to solve a problem: they’ll still miss a few, but at least they feel like they could do something. The other thing I want to say is to spend some time thinking about the entire test as a whole, rather than about each problem individually. Students will make mistakes on some of the problems, and by central limit theorem you’ll get a curve anyways. Time pressure becomes significantly more important, and the strongest students will come out ahead by simply being faster. Of course, I’ll never be able to persuade the problem czars (myself included) to not include at least one or two of those super-nice hard problems. But the point is that they’re not actually needed in situations like HMMT, when there are so many problems that it’s hard to not get a curve of scores. One suggestion many people won’t take: if you really want to include some difficulty problems that will take a while, decrease the length of the test. If you had 3 easy, 3 medium, and 1 hard problem, I bet that could work too. One hour is really not very much time. Actually, this has been experimentally verified. On my HMMT 2016 Geometry test, nobody solved any of problems 8-10, so the test was essentially seven problems long. The gradient of scores at the top and center still ended up being okay. 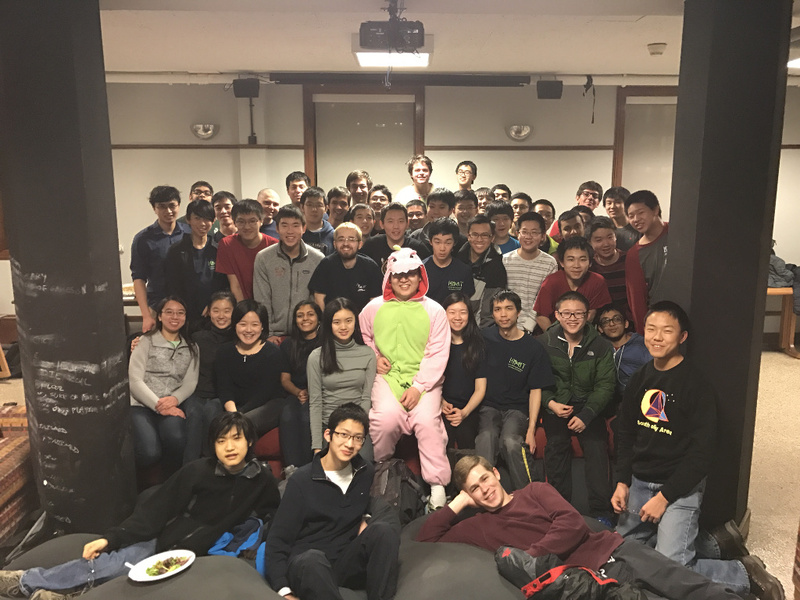 The only issue was that a third of the students solved zero problems, because the easy problems were either error-prone, or else were hit-or-miss (either solved quickly or not at all). Thus that’s another thing to watch out for.